Happy Cat. Take care of your new best friend, a cute little kitten! Clean her dirty fur and make it look fluffy and shiny again. Feed the adorable creature and play with her – look how much she loves to chase the ball! Now your cat is ready for a makeover! Choose a new color and pattern for her fur and apply various accessories to create a unique look for your sweet kitty. Finally, decorate the house and the garden and make your cat completely happy! Enjoy and have fun. 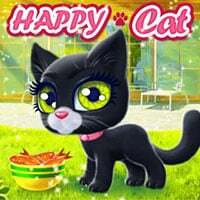 Happy Cat is a free online girls game on Round Games.